Meal No. 40: Tofu and Scallions in Mushroom Broth: Miso-Glazed Fish Fillets; Sesame Brown Rice and Cabbage; Caramelized Persimmons, available on Martha Stewart’s site. I think she has published nearly everything in Dinner at Home on her site. I guess she doesn’t need the money from book sales. Although I made one of the fall recipes back in the summer, due to its okra content, this week officially kicks off the Fall Menu section of the book. This menu isn’t the first in the section, but since I saw persimmons at Whole Foods, I decided to make this menu while I could. Luckily, I only made a half batch. I didn’t want to waste the entire package of dried shiitake mushrooms on the broth if the soup was going to be awful. I didn’t think it was awful, but it wasn’t great. 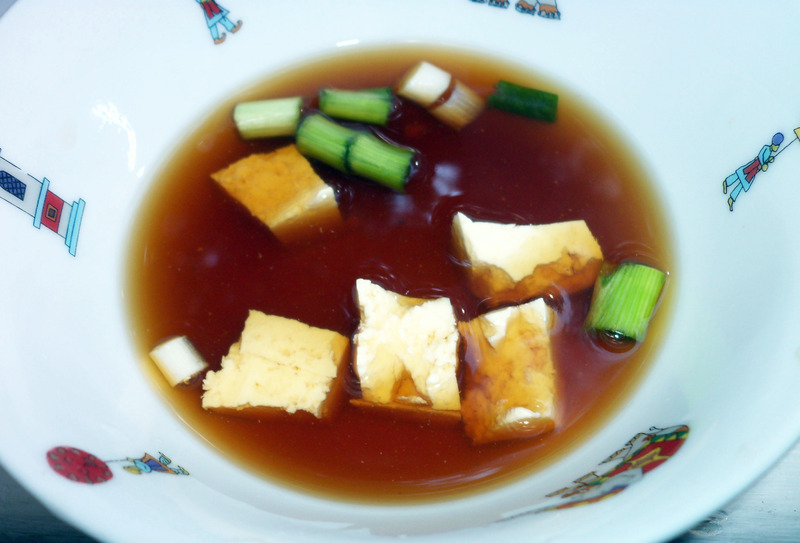 I think it was missing something; it was made with mushroom broth, tofu, scallions, rice vinegar and soy sauce. The Husband actively disliked it. It wasn’t as bad at the soup from the Spectral Beasts post. I was irritated that the mushrooms were strained out after cooking in the water. So wasteful, that Martha. We are holding onto them–maybe I will throw them in some scrambled eggs or something. The glaze was supposed to be a mixture of rice vinegar, mirin (Japanese sweet rice cooking wine), white (shiro) miso, and sugar. I went to the local Asian supermarket and they only seemed to carry Chinese sweet rice cooking wine. Was it the same thing? I don’t know, and got spooked by the warning on the label: Do Not Use for Beverages! Also, the fact that the ingredients listed “edible alcohol” on some bottles, and “ethyl alcohol” on others. So, I passed. I forgot to look elsewhere so when it came time to cook it I used some sweet vermouth that we had on hand. It turned out fine. I heated the mixture until the sugar melted, then smeared it on some halibut filets and broiled them for about 7 minutes. This turned out quite well! I think I would use less sugar next time, but I will probably make these again. I have a big tub of miso to use up, after all. This was also a winner! But you have to disregard Martha’s crazy brown rice cooking instructions, which say the rice will be cooked in 25 minutes. Ha ha ha haha. Anyone who has ever cooked brown rice knows it takes at least 3 days. Some Napa cabbage was sautéed in grape seed oil along with garlic and ginger, then removed to a bowl. The rice was browned in the oil briefly, then mixed with water and salt to boil then simmer. A month later the rice was done, and the cabbage mixture was tossed back in along with some rice vinegar and sesame seeds. I didn’t think about browning the seeds until just now but I bet it would be tasty. This had a very nice flavor, and went well with the fish. I could also see using this in a fried rice sort of dealie. There is no photo of it, as it lacked color and visual interest. The sole problem is that it only used one cup of the enormous Napa cabbage I bought. What to do with the rest of it? I don’t know anything about persimmons, including how to pick a ripe one. The cashier said the gnarlier they are the riper they are. It didn’t really look gnarly, but there was some black stuff that looked suspiciously like mold on the stem. How appetizing. These were to be halved, spread with honey and broiled, then topped with a squirt of lime juice. What actually happened is that the honey slid off the slices, ran into the pan and burned under the broiler, filling the stove and kitchen with smoke. Now the house smells like burnt marshmallows. 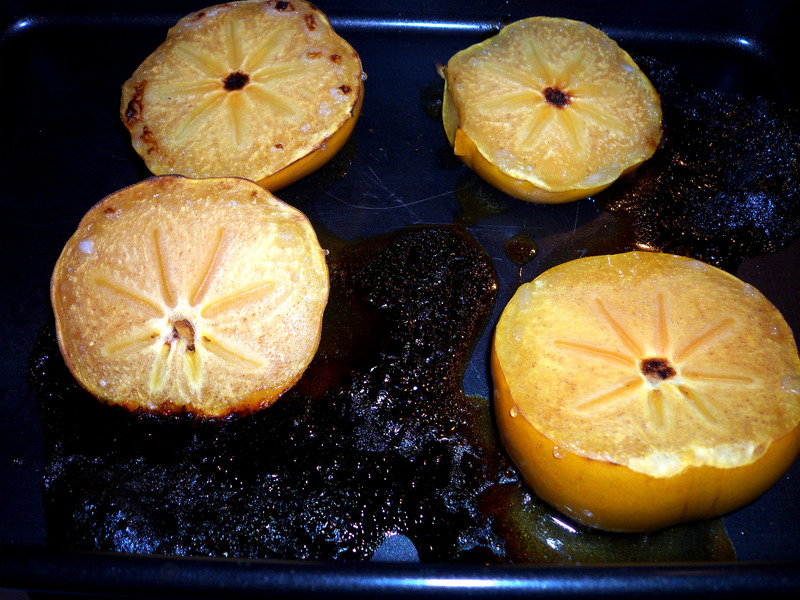 To serve, a mixture of mascarpone cheese, vanilla and more lime juice was dolloped atop the persimmon. What is mascarpone cheese doing in a Japanese menu?!?! The recipe, by the way, calls for 9 oz of mascarpone but my container held 8 oz. Lucky for me I only planned to make a smidgen. The flavor was ok, I suppose. I am not one to enjoy hot fruit unless there is some crust or strudel along with it. It kind of reminded me of peaches and cream, without the peachy flavor, but with the texture of an apple. I can’t describe it. The important items–the fish and rice, were a hit. The soup and dessert were not. I would buy an Asian cookbook from Martha if it were all entrees–they seem to be her best recipes in this cookbook, believe it or not. You know what else irks me about this menu? The broiled tofu calls for one and a half packages of tofu, for 4 people. Why not just use two, Martha?! Why not just be generous and give your family or friends an extra slice? Or be stingy and use just one container? Because what am I supposed to do with half a block of tofu? If anyone suggests tofu scrambled “eggs” you will be summarily unsubscribed from this blog. I don’t get the point of those–they don’t taste anything like an egg. And what is the vegan’s problem with eating eggs, anyway? What is the harm in eating an egg from a truly free-range chicken, that gets to roam around eating bugs, pooping wherever it wants, and biding its time until it gets carried off by a hawk (true story)? Those eggs won’t ever be chickens, so just eat the damn things. Since I had already purchased the tofu and apricots, I figured I should just make the stupid meal. I had an errand at the mall and found some organic soba noodles at nearby Fresh Market, where they were $35. Ok, not really. This week’s complete menu is on Martha Stewart’s website, evidently she invited Andie McDowell to make it on her TV show. She is just giving this stuff away, isn’t she? 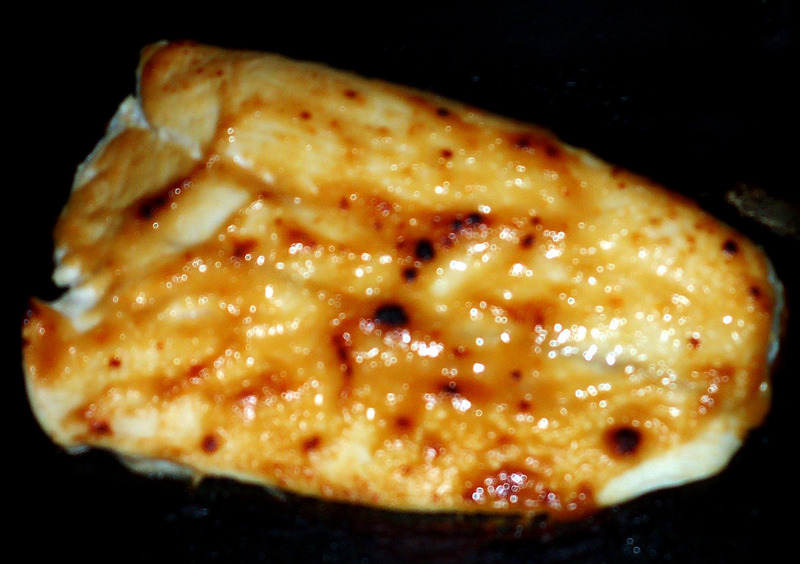 Tofu: The tofu was fine, and we liked the texture the broiling gave to it. I have a recipe for Thai-inspired marinated, grilled tofu with a carrot salad from my Weber grilling cookbook that is better. Also, she says to slice the tofu then press it, and everyone knows it’s easier to press it before you slice it. What is her problem? Sauce: Didn’t we make this a while back? Almost, but the dipping sauce for the sweet potatoes was just lemon and soy sauce, and this also has ginger and lemon peel. It’s good, but salty. The Husband liked it on the noodles. 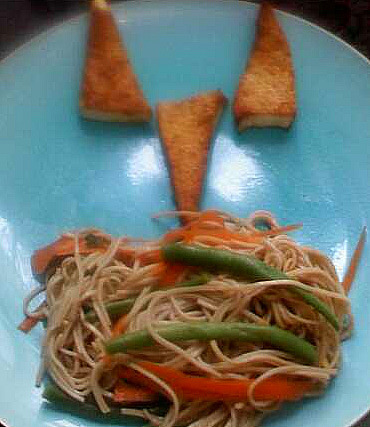 Soba Noodles: Martha is very, very fond of sugar snap peas. We’ve already used them once, and there’s another recipe that calls for them coming up. I admit they are cute, but they are not the most flavorful things. How about some eggplant or zucchini? I substituted some local green beans. It’s a long story, but I ended up with fewer noodles than the recipe called for, but the full amount of vegetables (including carrot tendrils). The flavor was good, but The Husband thought it needed the dipping sauce, which I thought made it too salty. It could use some garlic. Apricots: YUCK! I think I mentioned that this was my least favorite fruit. The dried ones I had to get for that couscous recipe weren’t too awful, but these were nasty. I used almonds with skins, instead of blanched, because that’s what I had and they tasted weird to me, like they were three days from going rancid. That, paired with the baked apricot, just grossed me out. 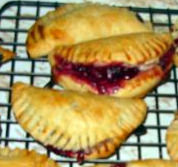 I had to eat a blackberry hand pie to recuperate. The Husband thought they were fine. He also pronounces them as APE-pricots, instead of AH-pricots, like I do. Last summer I grilled peaches with butter and brown sugar sprinkled on them. They were delicious. We should be doing that, instead. Or watermelon, to help get rid of all the salt we just ate. The tofu and soba noodles went well together, but it was a lot of salt; I did end up eating some watermelon afterwards. The apricots, aside from being icky, are a weird choice with the other menu items. 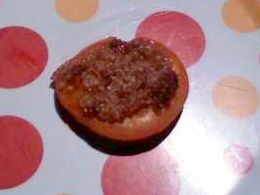 Baked apricots: Since I have a prejudice against them, and suspect the almonds were not right, I will concede to The Husband’s grade of B. But seriously, they were gross. Hyphen-palooza! In which Martha offers a Japan-inspired, often-hyphenated meal, where every dish has “about five ingredients and minimal prep.” This is also her first foray into recipes that seem like they were developed in the 21st century. A couple of my friends asked if this cookbook was one of her older ones, from the 1980s, but no, this was published in 2009. She does looks like she’s about 28 on the cover, though. On a personal note, not a lot of cooking happened last week—I had movie theater popcorn, quesadillas, or eggs for dinner most nights, but my stitches are now out. My Frankenfingers are not yet fully functional and it often feels like something is sawing them in half if they move, or sometimes when they are just minding their own business. (I suspect the nerves are growing back, and the muscle is, too?) so things are easier but not yet ideal.